For a long time it looked like airlines in Europe were invincible, with barely any airlines going out of business. Now we’ve seen a series of airlines in Europe face financial hardships over the past year plus, which was really started by airberlin ceasing operations, though has really gotten worse over the past several months. For those of you not familiar with Germania, they’re a German airline that has been in business for over 40 years. Initially they operated charter flights, but in recent years they also operated scheduled flights. 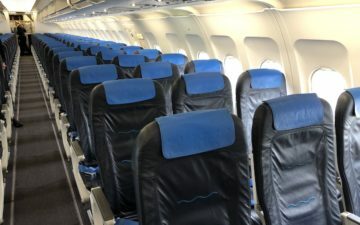 The airline had a fleet of 30 Airbus and Boeing narrowbody aircraft, and last year transported more than four million passengers. Last month there were signs of the airline being in trouble. On January 8, 2019, Germania announced that they were examining various financing options to meet their short-term needs. They said that it was business as usual for now, but obviously that didn’t last long. Then last week the airline announced they couldn’t pay their employees anymore, so the writing was on the wall here. This is of course incredibly unfortunate for both employees and passengers who were booked to fly with the airline. A government shutdown happened ahead of schedule perhaps? Hold on, wait a minute. Don’t just drop this on us without some info on what we can do with our Germania reservations. How can we get refunds? Will it be automatic? If an airline falls in the forest and no one has ever heard of it, does it make a sound? @Joe Chivas Unless your ticket was part of an inclusive tour arrangement, I am afraid you won’t get a refund. However, Lufthansa, Easyjet and other airlines offer reduced fares for Germania passengers. So, what’s the next Euro carrier to go bust: Wow Air then Norwegian? Some of those that we have lost (that I can remember) Air Berlin, Air Lituanica, BMI, Cobalt Air, Estonian Air, Malev, Spanair, Primera air, Portugalia, SkyGreece, Transaero and I’m sure there are others. Portugalia was bought by TAP Air Portugal and still exists. It flies under the TAP Express brand but if you take one of the Embraer flights, you’ll see “operated by Portugalia Airlines”. Why has everybody (including Lucky) forgotten about Monarch? God their collapse is going to cause GERmania!!! Are there frequent flyers called Germaniacs? !